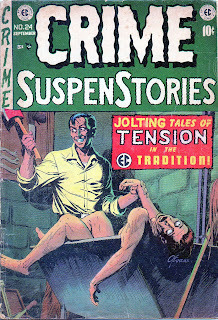 Today's pick is my copy of Crime SuspenStories #24 from 1954, with cover art by the very talented, late George Evans. I picked this one because I think it is the most terrifying of all EC covers; no vampires, no witches, and not even an ooze-dripping zombie in sight! Just the reality of what horrible evil a regular human being is capable of; and to me, that is more terrifying than an entire army of the undead.